The Pollen Man produces a special type of pollen in Northern British Columbia that contains every known vitamin and nutrient known to science. This special pollen is 100% mountain wild flowers and fruit trees. (no vegetational crops), yielding a high protein, low sugar pollen containing all know amino acids, in the same ratio as your body; completely natural and organic. At 60 calories per tablespoon, two tablespoons translates into the protein content of a 3-4 oz. steak, but without any of the associated fats or chemicals. This bee pollen contains 5-7 times the amount of protein per ounce as meat, fish, cheese, or eggs. Two tablespoons per day renders 100% of the required vitamins and nutrients needed by the body. Most pollens are oven dried or ground into capsules, both processes kill the nutrients. 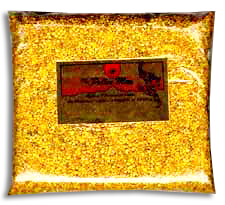 The Pollen Man pollen is sun and air dried which retains the nutritional integrity and value of the pollen. A recommended dosage is 2-4 tablespoons per day. A Pound of Pure Pollen! . . .